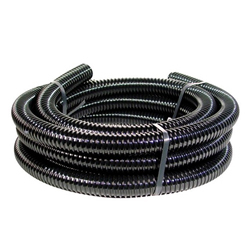 This Kink-Free tubing is ideal for water gardening applications. Ribbed externally but smooth bore for minimum water flow restriction. Kink Free Tubing is Flexible, Yet Will Not Crimp or Collapse Around Curves. Available in 3/4", 1", 1 1/4", 1 1/2", & 2"
Notice: This tubing works best with Alita, Little Giant, Oase, ProEco, Laguna, and Savio Products. Due to variations in fittings, some buildup may be required for secure fit.